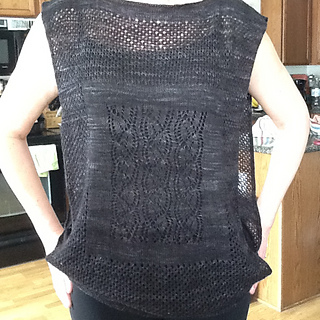 This light and lovely tunic-style top was inspired by the lace patterns in vintage chemises; layering it over a tank top makes it perfectly decent for daytime wear while keeping it cool enough for warm temperatures. 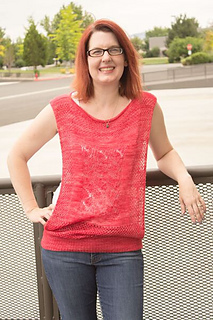 Knit in two pieces and joined at the bottom band and shoulder seams, the construction is as simple as can be and adaptable for different body types. Make the head opening as wide as you want; add extra width to create a drop shoulder; seam the sides or leave them open - it’s up to you! 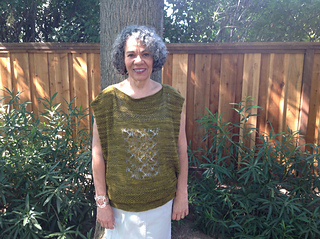 I designed this top to feature Madelinetosh Prairie - specifically, the special shipment of Prairie Short Skeins (first quality, only 100 yards short, sold at a great discount - but when they’re gone, they’re gone!) received by Jimmy Beans Wool. 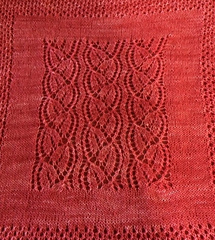 The tonal colors of the hand-dyed, single-ply wool are just gorgeous and make this tunic absolutely stunning. 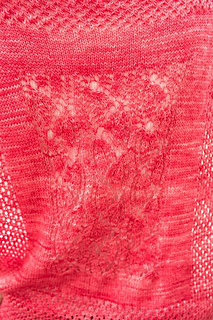 Sample knit shown is the color Espadrilles, in size small, and used just over one skein of the Short Skeins yarn (740 yds each). You may be able to use just one skein of regular Prairie (840 yds each) for the smallest size, but get an extra just in case - you can always return it if it’s unwound. All other sizes require 2 skeins.